Is the day of the fitting room finally over? It may be hard to tell how a garment will fit based on a photo, but Internet retailers are hard at work to make buying online even easier than buying in-store. With free shipping, easy returns and even stylists to help you get the perfect look, your bedroom has become the new fitting room. 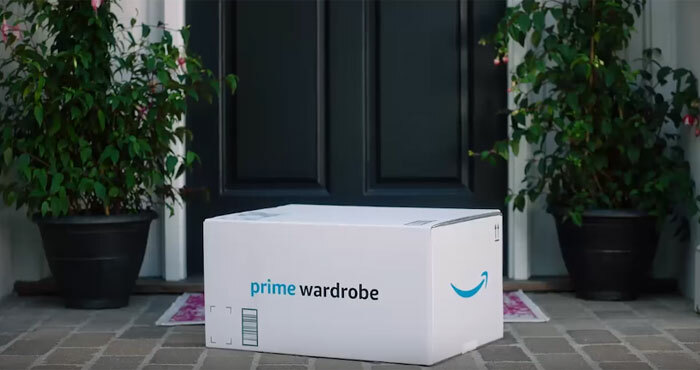 Amazon has been part of this trend, offering no-questions-asked returns on fashion items, but now the company is taking its efforts a step further with Amazon Prime Wardrobe. With this new service, not only can you return items you don't like: you don't even have to pay for them until you decide you want to keep them. Pick out three to 15 Prime Wardrobe. items you'd like to try out. These will be clearly marked while you're browsing clothes on Amazon. When you receive your items, you have seven days to decide if you like them. You can try them on in the comfort of your own home and see how they mix with the rest of your wardrobe. Send anything you don't like back to Amazon using the original shipping box and a pre-paid shipping label. You can drop it off at UPS or schedule a pickup. You'll be billed for whatever you keep. If you keep three or four items, you get 10% off the original price. If you keep five or more, you get 20% off — so be sure to shop items you'll love for the best deals! You can choose from over million different items of clothing, as well as shoes and accessories. It's clothes shopping for the whole family, with options for men, women, kids and babies, from brands like Calvin Klein, Levi's and Hugo Boss. That's a much bigger selection than you'd get in a typical department store, though even with Amazon's generous return policy it lacks the instant gratification of browsing the department store racks. Amazon isn't the only brand trying to make online fashion shopping better than walking into a store. Many online clothing retailers offer easy returns to help shoppers wary of buying items sight unseen, with Zappos standing out for allowing returns up to 365 days after purchase. Flash sale sites like Gilt allow you to find bargains without hunting through clearance racks. Online styling services are also growing popular, with Stitch Fix, Trunk Club and others picking out a selection of clothes just for you and allowing you to return whatever you don't like. While Amazon doesn't offer personal styling services, the mega-retailer wins points for flexibility by letting you pick out exactly what you want. If you're interested in trying Amazon Prime Wardrobe, you'll need to be a Prime member. At $99 per year, that's a steep price to pay if all you're interested in is clothes, but if you're already a Prime member this adds a lot of value for the fashionista set. The service is currently in beta, but you can sign up to be notified when it's available.